Mrs. Fields® Ultimate Bright 'n' Sunny Cookie Basket. 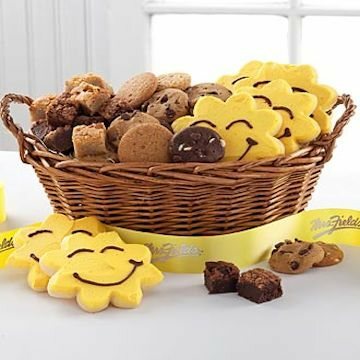 Send "Happy" thoughts with the Ultimate Bright 'n' Sunny Cookie Basket. Sends a sunshine smile along with Mrs. Fields® 84-piece basket. This gift basket includes the following: 54 Nibblers®, 24 Brownie Bites and 6 hand-frosted sunshine cookies.